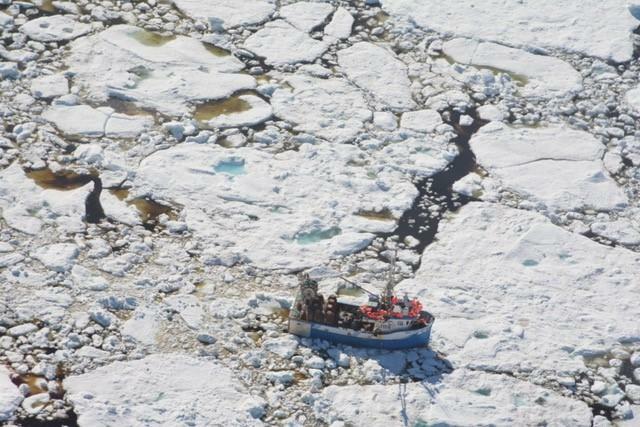 WASHINGTON D.C. — More Arctic sea ice is entering the North Atlantic Ocean than before, making it increasingly dangerous for ships to navigate those waters in late spring, according to new research. The study authors conclude that warming temperatures due to climate change are melting more Arctic ice, increasing ice mobility and opening channels that are normally frozen shut. They predict last year's events could occur more often in the future as Arctic temperatures continue to rise. "It's counterintuitive to most people, because it means you can have an increase in local ice hazards because of a changing climate in the high Arctic," said David Barber, an Arctic climate researcher at the University of Manitoba in Winnipeg, Canada and lead author of the new study in Geophysical Research Letters, a journal of the American Geophysical Union. "This is something we need to better prepare for in the future, because we expect this phenomenon to go on for at least a couple more decades as we transition to an ice-free Arctic in the summer." But a large amount of sea ice lingered along Canada's east coast into May and June of 2017. The unusually thick ice cover took ships by surprise. The ice was much thicker than usual – up to 8 meters (26 feet) thick in some cases. Off the Newfoundland coast, an unprecedented number of ships, fishing vessels and ferry boats became trapped in the ice. Between search and rescue missions, Barber and other scientists aboard the Amundsen used the ship's research equipment to figure out where the sea ice had come from and why so much ice was there at all. They took samples of the ice and measured its thickness, temperature and salinity. They used drones to take aerial images of the ice cover, and satellite data from the Canadian Ice Service to track sea ice movements back in time. Events like the ice conditions Barber witnessed are difficult to forecast, so scientists and decision-makers need to be prepared for them, said Ronald Kwok, a climate researcher at NASA's Jet Propulsion Laboratory in Pasadena, California, who was not connected to the new study. Barber and other researchers have been monitoring the ice closely and don't expect as much ice to travel south this year. But just in case, they've informed the Canadian coast guard so more than one icebreaker can be available for search and rescue.